Deckaid is a pop up skateboard art exhibition which benefits youth based charities. The show involves a growing collaboration of skateboard collectors whose archives have rarely, if ever, been accessible to public viewing. 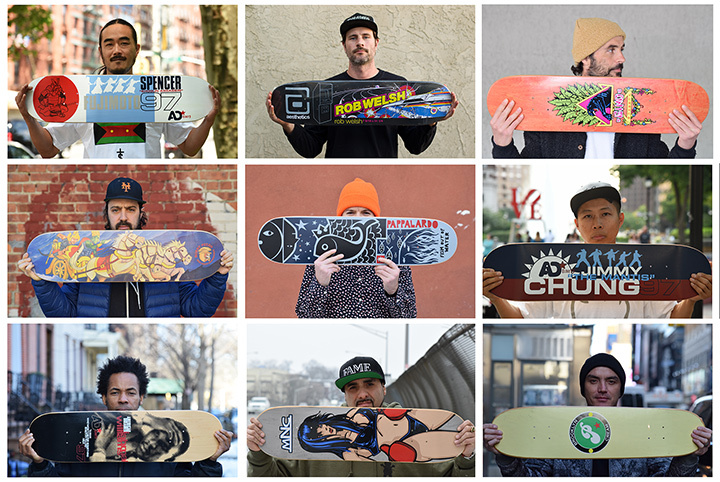 The show also features an ongoing photography series connecting skateboarders to their classic board graphics. The first Deckaid show was held at Sideshow Gallery in Brooklyn, NY, Summer 0f 2015. The event raised over $6,000 for Skateistan, an international NGO that combines skateboarding and academic education for youth ages 5-18 in Afghanistan, Cambodia, and South Africa. The Second Deckaid show was held in Philadelphia at Exit Skateshop, Proceeds from the show were donated to Skateistan. The Third Deckaid Show was held in Boston at Orchard Skateshop. Proceeds from the show were dontated to Horizons for Homeless Children. The Fourth and next Deckaid show will be in Washington D.C. at The Fridge April 1st, 2017. Vheck out the Deckaid online store, and help support the show!